There are, of course many variations of the perfect sandwich loaf. Probably every bread-baking culture has its version. And probably a lot depends on the kind of sandwiches the people of the culture like to eat. So, for instance, Jewish sandwich bread, at least those breads from Eastern Europe, tend to be heavy on the rye flour, sometimes with caraway and always smothered with something like corned beef and onions. In France the perfect sandwich bread is a baguette-like roll called 'pain ordinaire', or ordinary bread. This is no ordinary bread, however. It is typically loaded up with a good hard, sharp cheese and washed down with strong coffee. This bread is Italian in origin, at least from its herb content, but the style is definitely French. A hybrid of sorts. The original contained some coarsely ground black pepper, which I have omitted since I know my customers. Personally I like food with a little heat, but my house mates.... not so much. Anyway, this bread, because of the added herbs and spices is great for sharp cheeses, or pickled or cured meats (cold cuts, corned beef, sausage) and even crispy veggies. Or a combination. 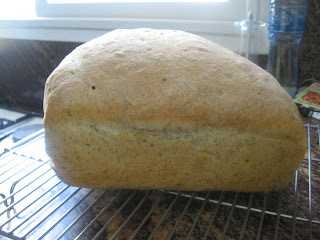 It has a fairly close crumb, which could be more open if you leave to rise a little longer. The crust is only a little chewy. But I actually like it the way it is, since the density helps hold the contents of the sandwich. Enjoy!! 1. 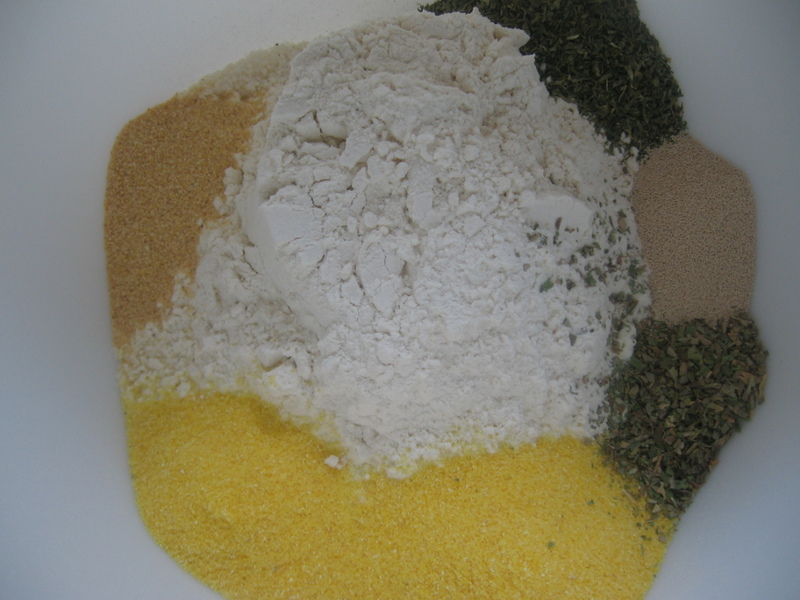 Mix all the dry ingredients, including the herbs and the yeast together and mix thoroughly. 2. Add the water mixing as you pour it to form a rough dough. 3. 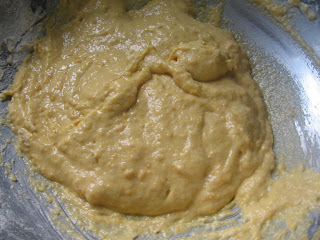 Knead this mixture on a lightly-floured tabletop for about 10 minutes until it becomes quite smooth. It will be a little tacky, but smooth, and not at all sticky. Adjust the flour and/or water as needed to get the right texture. 4. 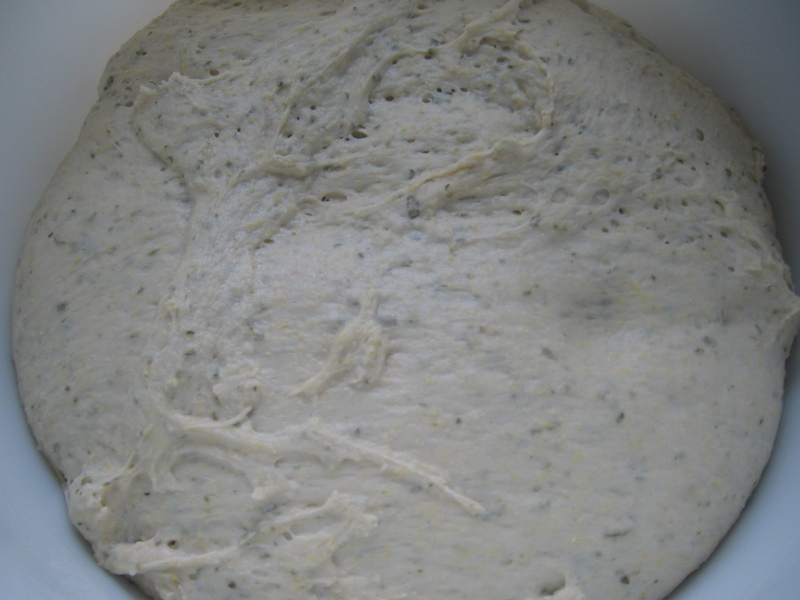 Place the kneaded dough into a lightly-oiled bowl, turn to coat, then cover and let it rise in a warm place until doubled. This will take 1 1/2 to 2 hours. 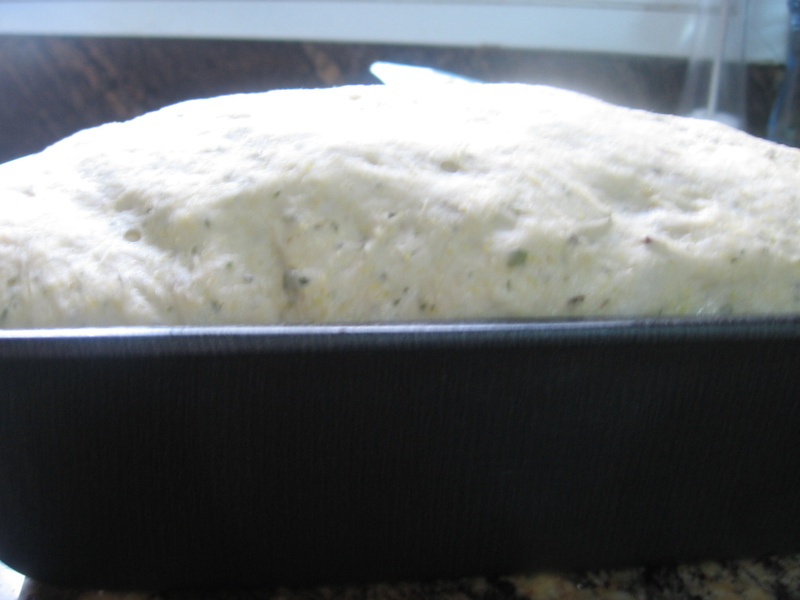 You may stretch and fold the dough halfway through if desired to develop the gluten more fully. 5. 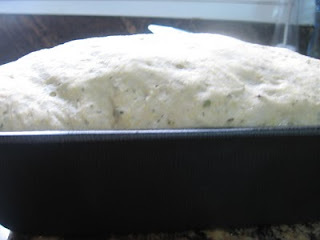 Form into a loaf shape and place into a prepared loaf pan. Let the dough rise again until it is about 1 inch (2 1/2 cm) above the lip of the pan. 6. Bake in a preheated oven at 350 F (175 C) for about 45 minutes. In a convection oven, bake at 300 F (150 C). In North America, sweet potatoes or yams are traditionally harvested and eaten in the fall of the year. Sweet potatoes are root vegetables and, although they look very much like regular potatoes, have certain qualities that make them ideal for bread. They are sweet of course, hence the name. 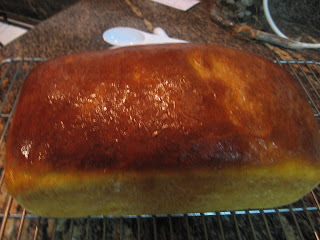 More importantly, they are orange in color something that adds a wonderful, delicate shade to the bread. They are to be found everywhere in the world in many shapes and sizes. In Israel we have a member of this family, locally called batata, (stress on the second syllable) an Arabic word for potato. It is both similar in texture and bright orange just like the North American sweet potato. It can be used interchangeably for all recipes that call for sweet potato. 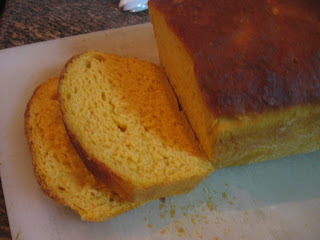 I have even used it to make a great sweet potato pie and candied yams. This bread is a soft, delicate sandwich bread that is a gentle orange color. It is not the screechy, bright orange of Halloween, but rather it takes on a subdued, understated hue. It is perfect for sandwiches that have drier contents (meat and/or cheese) but probably would not be appropriate for wetter ingredients (like sauces and gravies). Mostly, it's delicious and perfect for breakfast. Makes great toast, too, and tastes great with butter or jam. 1. Make the poolish by mixing the ingredients together. Let it sit, covered, at room temperature for about 3 hours. Place in the refrigerator overnight. 2. Peel and mash the baked sweet potatoes. You can bake them with the rosemary if you wish to intensify the flavor. 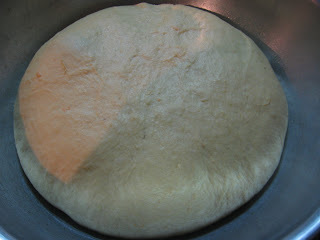 and place the dough in an oiled bowl, covered, to rise. Let the dough rise until doubled, in a warm place. This will take about 1 1/2 to 2 hours. 4. De-gas the dough as little as possible when handling. 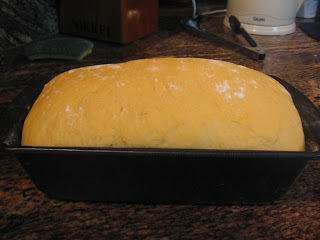 Form the dough into 2 round loaves, or torpedo shape or even rolls. Cover with a towel for a final rise, about 45 minutes. 5. Bake at 350F (175C) for about 40 minutes for loaves, or about 20 minutes for rolls. Cool on a rack.